The worldwide market leader in flash memory cards, SanDisk Corporation has announced the availability of its new 32GB SanDisk Extreme SDHC card, which the company claims as the world’s fastest 32 gigabyte SDHC card on the market, supporting up to 30 MB/s (megabytes per second) read and write speeds, offering photography and video enthusiasts a maximum data-transfer rates. According to SanDisk, the 32GB Extreme SDHC card offers a sustained write speed fast enough to ensure HD video recording and capacity capable of storing 160 minutes of full HD (1920×1080 pixels resolution) at 24Mb/s data transfer rate. 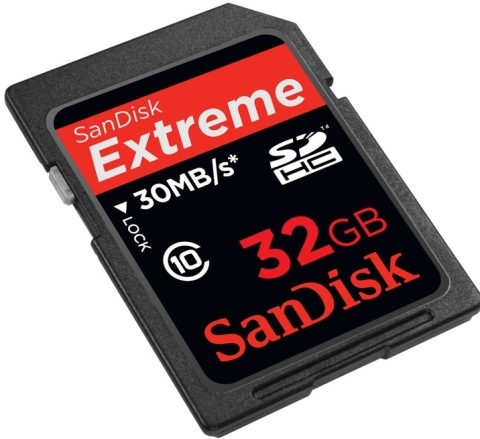 The new 32GB SanDisk Extreme SDHC memory card that adheres to the SD Association’s new Class 10 specification will hit the market in coming August, and the current 4, 8 and 16GB SanDisk Extreme SDHC cards will be upgraded from Class 6 to Class 10 in August 2009.